The authors promised the short sroies that made up Someting Short would make an impact - they certainly do. I loved the morals behind some of them, wit in others and time for reflection in some. I couldn't pick a favourite because each story is interesting and brings someting different.I did particularly warm to the stories with Scots dialogue. The presentation and format of the whole book was excellent. A well worth read for a well worth cause. 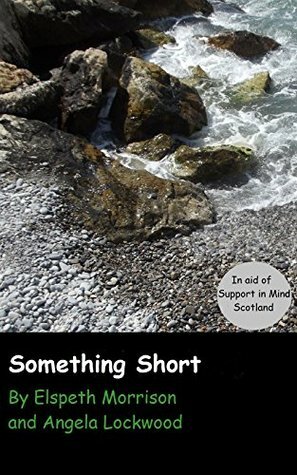 4.5/5 StarsI read Something Short By Elspeth Morrison and Angela Lockwood with my Kindle Unlimited subscription. This is a great collection of 15 short stories, alternating back and forth between each author. The reader will find strong writing with a wide range of topics. Two of my favorite stories were 'Begonia' by Morrison and 'The Perfect Crime' by Lockwood - and I have to say, as a researcher, 'Animals' by Lockwood gave me a good laugh. This is a quick read definitely worth your time if you like short pieces. This is billed as a book of short stories but it is, in my opinion, a wonderfully imaginative collection of slice-of-life observations written by two women who each have an eye for the commonplace and the creative spark to make what they see interesting to the rest of us. 'The Wee Baldy Man' is, I think, a good example of their ability to connect with readers. How many of us have, as the author did, found ourselves sitting alone in a park or an outdoor cafe watching people go about their daily business and, because we were either bored or fascinated, imagining what their lives were like?The answer is, of course, that most of us have done that at least once in our lives. The difference between us and the author is that she wrote her imaginings down while most of us never did.Some of the tales in this little book are frivolous and others are, though not very long, remarkably poignant. There is, for example, a short story about a young man bringing his sister a birthday present. It's a simple tale told with astonishing feeling.Authors Elspeth Morrison and Angela Lockwood have separate and distinct voices but their collection does not jar the senses because of that. In fact, their different voices add richness to this book.I highly recommend it. Reading "Something Short" is like letting my eyeballs take a virtual tour through a verbal landscape of small rolling hills alternating with sharp deep drops into sometimes scary crevices.For me, Ms Lockwood's short stories feel more complete than Ms Morrison's, the latter feeling more like sketches and explorations, but -That said, alternating side by side, they gave me a rare sense of experiential immersion. While Ms Lockwood's stories flowed with lightness and ease of observation (often using dialects from regions outside the story settings which provided interesting color), Ms Morrison's work felt more intense. This despite the latter author's heavy use of exposition vs showing. I felt her occasional use of similes gave tempting tastes of an aptitude worth expanding.Another interesting contrast for me was that Ms Lockwood's shorts felt like opening chapters to a longer leisurely novel or novella, while Ms Morrison's short pieces were like short explosive opening scenes for a film.Much potential and much substance in these bite size verbal snacks.Very easy to digest and enjoy. This is an excellent collection of short stories written by two talented ladies. I enjoyed all of them, but I especially liked the last story “Gimme Shelter” by Angela Lockwood because of its unexpected ending. I also liked her story called “Animals”, which is an account of a major crush a scientist has on a cute animal right activist protesting in front of his laboratory. The theme of this short story is much more complex than just another fascinating example of love against all odds. I was also quite impressed by “Changes”, a sinister story written by E. Morrison, which shows religious conversion in its cold and heartless form. I could go on and on, because this is an amazing book worth reading. Each story touches a different aspect of life, so different readers will find their own favorites in this collection. This was such a fascinating and entertaining read. Short stories covering a variety of subject and people, and written by two authors, who managed to compliment each other's individual styles.It is difficult to pick a favourite story, and it's not really necessary. The authors managed to make each and every one of their short tales to life, with interesting characters and poignant titbits. No spoilers here.Very enjoyable. This was an enjoyable collection of short stories - as snippets of lives and events. Each of them were short enough to read in a coffee break, and each of them different.Both authors offer a slightly different style, which makes putting this book down and picking it up again very easy and inspiring.Definitely enjoyed all of them, and would read more from both authors! An interesting collection of short stories, well worth a look. The characters are interesting and skillfully drawn and this is a very enjoyable read. A lot of variety here to keep you occupied, and the proceeds going to charity is an added bonus. Left me wanting more! An impacting collection of short stories. These stories are well-written, emotive and clever. Each author brings their unique characters and prose. It is hard to pick which story I like the best as they were all very captivating. Well-done!